Prominent & Leading Manufacturer from Mumbai, we offer ceiling cooling system and modular ceiling cooling system. Owing to our proficiency in this domain, we are offering our clients a wide gamut of Ceiling Cooling System. We are giving this cooling system with piping grid is concealed and embedded within the twenty five mm thick false ceiling. The cooling systems offered by us ensure uniform cooling and cooling comfort in your room even in the extreme hot climate conditions. Also, we delivered these cooling systems at the clients’ end within the promised time frame. As a well-known integrated climate control solution provider, we are offering our clients high quality Modular Ceiling Cooling System for buildings. Our cooling systems give a uniform cooling across your room, even in the extreme hot climate conditions. These cooling systems are examined from our end on numerous parameters so as to deliver a flawless performance to customers. We offer these cooling systems at reasonable prices and in numerous specifications. 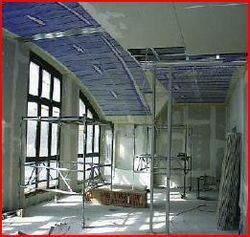 Looking for Ceiling Cooling System ?